Mission Point Resort: This is a large resort with nice views on a quiet side of the island. 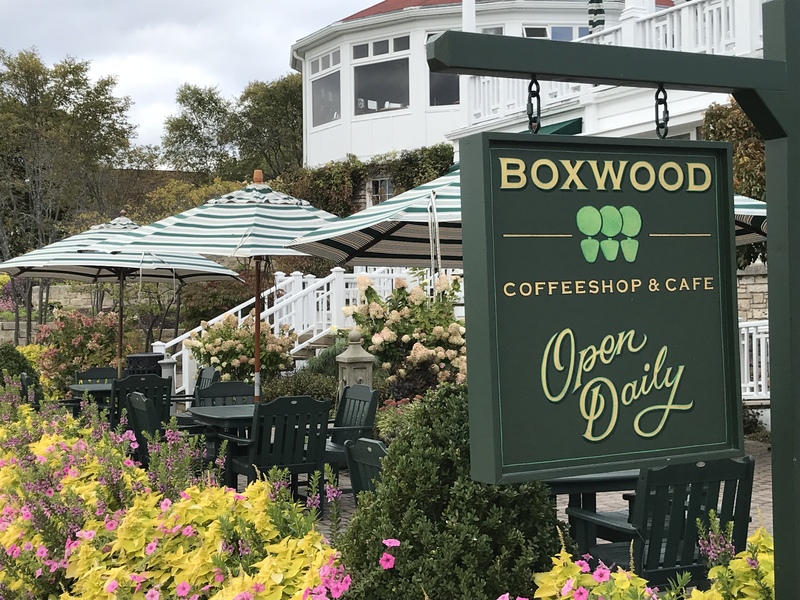 They offer a full breakfast buffet in the Round Island Bar & Grill, plus they have Chianti for fine dining, the Bistro on the Greens and the Boxwood Coffeeshop & Cafe. There is a gym, boutique, spa and salon, putting green, tennis courts and bike rentals. I enjoyed my stay and the fact that I could walk into town to explore or enjoy a local restaurant and not have to rely totally on the horse-drawn taxis. Grand Hotel: For over 130 years, the historic Grand Hotel is a great example of old-world hospitality and charm from a bygone era. 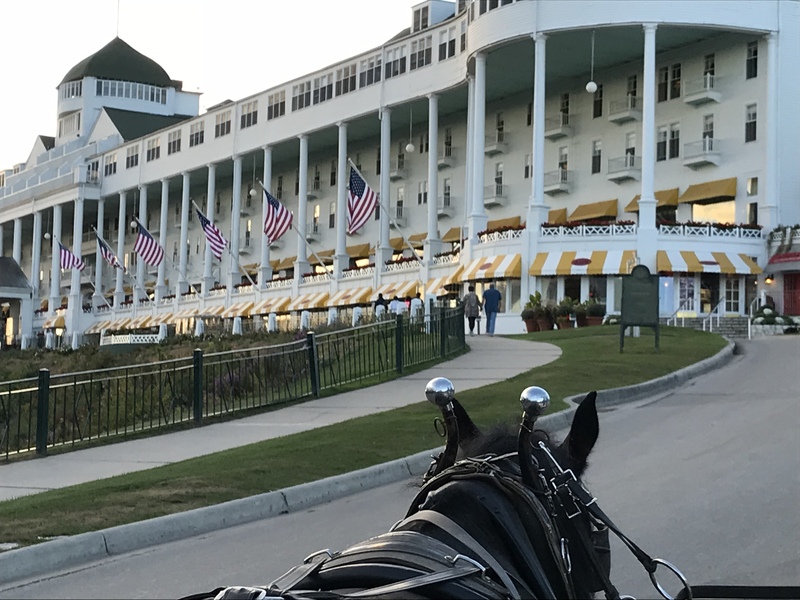 From the historic building, the traditional afternoon tea in the parlor, the tradition of dressing up for dinner in the dining room, nightly dancing to the sounds of the Grand Hotel Orchestra to sitting on the world’s longest porch with views of the Straits of Mackinac you must visit it when on the island. The 1980 film, Somewhere in Time was filmed at the hotel and starred Christopher Reeve, Jane Seymour and Christopher Plummer. The Hotel has several dining options. There is the Main Dining Room, Carleton’s Tea Store which features food as well, Afternoon Tea in the Parlor and Sadie’s Ice Cream Parlor just outside of the main entrance. The Woods, located near Stonecliff, is the perfect spot for dinner. The Jockey Club is located on the golf course. Just down the hill from the entrance is The Game House, a casual bar and restaurant and Sushi Grand the newest addition to the group which is the island’s first sushi restaurant. For having a drink there is the Terrace Room with dancing to live music, the Audubon Wine Bar right off the lobby, the Cupola Bar upstairs with great views and the Geranium Bar adjacent to the Main Dining Room. 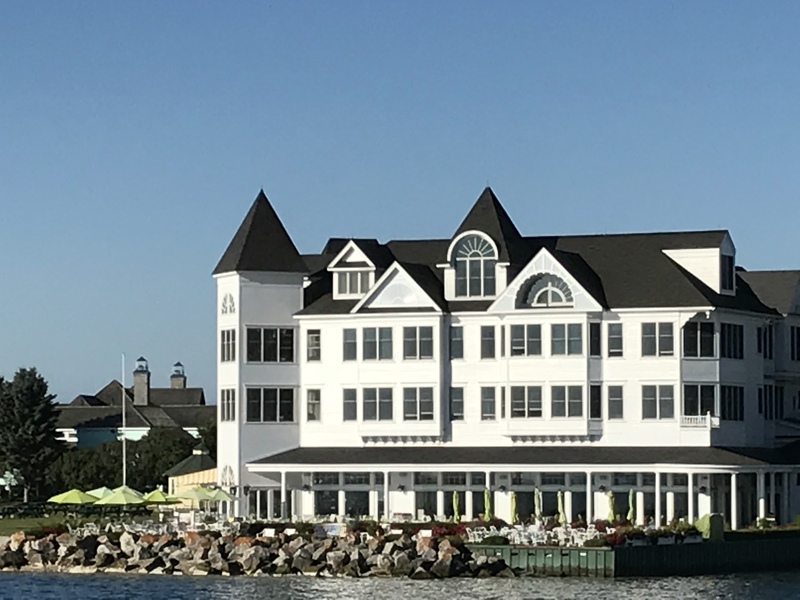 The hotel also operates the Fort Mackinac Tea Room up at the Fort and the Cawthorne’s Village Inn, downtown at 1304 Hoban St., for cocktails and more casual dining. 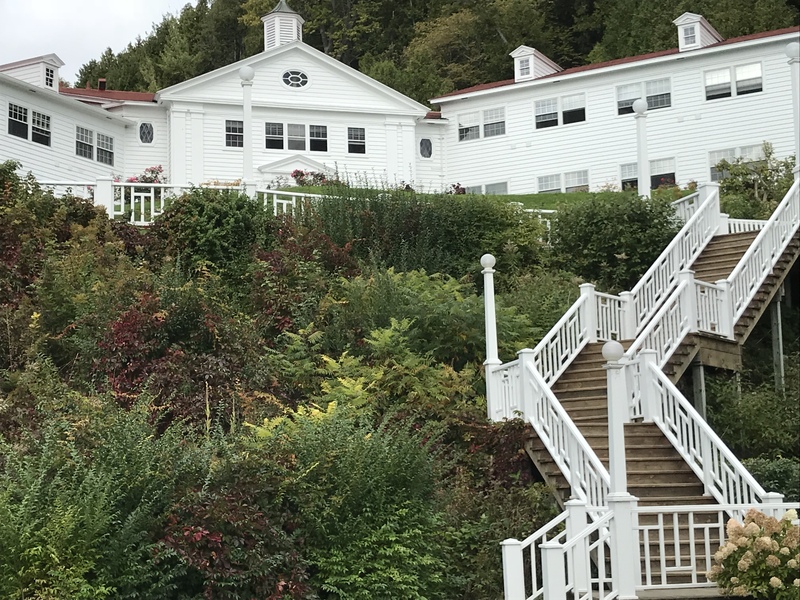 Both Mission Point and The Grand Hotel were named as two of the top 10 Midwest Resorts in 2017 by Conde Nast Traveler Magazine. The Grand was also one of the top Midwest Resorts named by Travel + Leisure Magazine in 2017. Iroquois Hotel: This is an award winning hotel located at the western end of Main Street downtown. The once private home, built in 1900, is a charming spot with wonderful views of the water. It has 36 rooms and 9 suites along with the Carriage House Restaurant which has both indoor and outdoor patio seating. I went for dinner and loved the experience. The Inn at Stonecliffe: For those wanting to stay in a quiet location, The Inn at Stonecliffe is located in the woods in an historic mansion from 1904 that was renovated in 2014. It is somewhat isolated so you will have to use bikes or take a horse-drawn taxi to and from downtown. You can eat at the hotel or walk nearby to the Woods Restaurant, the Bavarian themed restaurant, which is run by the Grand Hotel. 8593 Cudahy Circle. 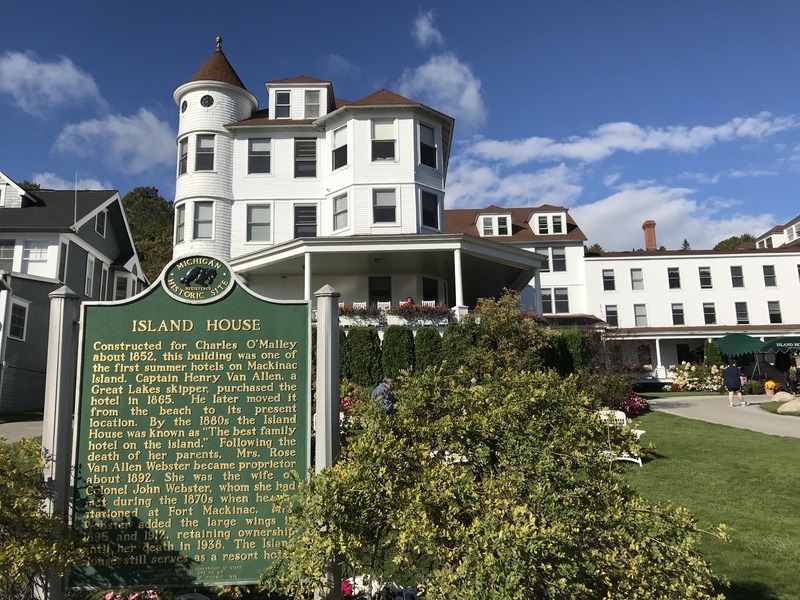 Other options to consider include the Harbor View Inn that was a private home from 1822 and the Island House Hotel which is the oldest hotel on the island from 1852.